This paper by Marvin Brown, published alongside three others, is one of many proposals for a systemic alternative we have published or will be publishing here at the Next System Project. You can read it below, or download the PDF. We have commissioned these papers in order to facilitate an informed and comprehensive discussion of “new systems,” and as part of this effort we have also created a comparative framework which provides a basis for evaluating system proposals according to a common set of criteria. Many of us agree that the economy we have is not the economy we want. There are alternatives: a solidarity economy, a sharing economy, a local economy, an ownership economy, and so on. Many of you know about some of these. All are good, and I think we are still looking. As an additional alternative, I want to propose a civic economy—an economy based on civic relations rather than property relations—designed to make provisions for all rather than making money for the few.1 A civic economy will not ignore our social differences. It will use our common humanity as a basis for engaging in civic conversations about how to redesign our social and economic worlds so they are just and sustainable. Capitalism, as it has come down to us over the past three centuries, violates the principle of a common humanity by splitting off from its “story” the burden borne by the real providers of wealth, both human and otherwise. There is no better illustration of this than Adam Smith’s silence about the role of slaves in creating the wealth his nation enjoyed.2 The actual origin of capitalism resides in the Atlantic triangle trade connecting Europe, Africa, and the American colonies. During this period, new theories of property and property relations were developed to explain and to justify the Atlantic economy, which involved the enslavement of more than eleven million Africans to supply the labor for the growing economies of Europe and white America. Slaves, at the time, were treated as property. They received no more sympathy and consideration than cattle or horses. This is a hard truth about capitalism that is usually denied. I think the refusal to integrate this history into our views of modern economics prevents us from telling the truth about the current destruction of the environment, or to acknowledge—really acknowledge—the misery of workers today who provide us our goods. Facing this history—and thus reconnecting with the real providers of wealth—is the only way out of the property-based economics of capitalism and into a civic economy of different systems of provision that could save the future for our children and grandchildren. A civic economy of provisions could give us a chance to repair the violations of our common humanity. Although neither author uses the notion of provisioning as a major theme, they open the door to such an approach. The real economy, it seems to me, should be transformed to one where all people, organized together in many ways, are able to make provisions for their families and communities. If we are to provide one another with the basics for a good life, we will need to also protect providers—the planet and people. We need to protect common resources and cooperative activities. Instead of focusing on property rights, we need to focus on human rights. Instead of seeing the natural world as a commodity, we need to recognize it as a living being that gives us life. If we do create this type of economy, we will also create a way of living together that gives us meaningful relationships and self-worth. In short, the civic economy of provision seeks, as a matter of priority, to return our thinking about the economy to a matter first of principles, and to our conversations about and with each other about what truly matters most deeply to us. In the economics-of-property tradition, the focus has been on the individual or economic man, who acts in his self-interest and tries to maximize his good fortune. The economics of provision offers an alternative. It follows Virginia Held’s suggestion that the image of the mother and child more correctly represents our human nature.5 This image highlights a relationship of attachment, instead of isolation, and allows us to acknowledge the labor of the parent in making provisions for the child. Furthermore, it imagines a relationship of mutual identity, rather than one based on each individual’s self-interest. As Nancy Folbre argues in her book The Invisible Heart, the family has been largely eliminated from economic thinking, and yet the family is the primary location where we provide and care for one another.6 True, individuals do want to provide for themselves, but we do this in community with others. Economics, in other words, is not simply about individuals, but about individuals in communities. In our modern economy, of course, making provisions for families and communities occurs through various systems, such as the food or the health care system. These systems can be seen as systems of provision that could be organized to make provisions for all. How they are organized, of course, is a major question. Many people see only two organizing options: capitalism or socialism. A civic economy of provision is another option. As citizens, guided by such civic norms as reciprocity and moral equality, we can engage in civic conversations to turn economic systems toward sustainability and justice. If we are smart citizens, we will not discard things that can work, such as markets and property rights, but we will also not allow them to control our fate. The framework of a civic economy of provision integrates the three basic practices of any human community: providing for one another, protecting one another, and creating meaning together. Whether we use markets for making provisions or property rights for managing resources depends on how we decide to live together. Markets, for example, should never violate the civic principle of reciprocity, and property rights should never override our common rights to natural resources. Still, sometimes, markets can be useful in meeting people’s preferences and paying for the use of resources. Private ownership can encourage personal stewardship. The point is to ensure that the economy fulfills its purpose of making provisions for all based on principles of justice and sustainability. Actually, one can picture the real economy as belonging to three distinct sub-systems: the ecological system of the biosphere, the social system of human societies, and the civic system of discourse. The ecological system sustains us and other living things. We belong to it—are nested in it. It is the context of our common humanity. This ecological system provides resources for the making of provisions for families and communities. Social systems comprise sets of relationships that unite and divide us, including the traditionally-defined economy. All organizations and institutions belong to society, including businesses, governments, and what are called “civil society” organizations. Instead of ignoring the social identity of civil society organizations, a civic approach sees them within the matrix of social differences and conflicts. Like other social organizations and institutions, their purpose is to play their role in creating communities where members can provide for and protect one another. The civic is grounded in our common humanity, and emerges through conversations that arise, for the most part, from disagreements about how to handle our social differences. Civic conversations take up controversial social and economic issues in such a way that the participants draw on their shared humanity to listen and learn from one another. These civic conversations can take place in a variety of forums, from neighborhood meetings and workplace sessions to city council workshops, with processes for scaling up to larger groupings and geographies. If we are to base the economy on civic relations instead of property relations, then we need to use reciprocity as the moral foundation for making exchanges. In specific exchanges, people should receive in proportion to what they have given. More generally, a just human system based on reciprocity will continually aim for what Lawrence Becker has called “balanced social relationships.”7 This would be a vastly different social world than the current disparity between the extremely rich and the rest of us. So what about the workplace? Can workers and managers engage in civic deliberation? They certainly have conflicts, but are these conflicts based on different interests? In the old economics, of property-oriented business model, they are, since the conflict is about the value or price of different properties (labor, land, and money). But, if we switch to a new economics of provision that is based on civic relations, the picture looks much different. First of all, the role or purpose of the business organization changes from return on investment to that of making provisions. In this model, all members of the organization are “employed” to fulfill the mission of providing quality goods and services. They may disagree about the best means of doing that, but not about the company’s purpose. In fact, this common purpose gives them a shared vision that enables them to deliberate on how best to realize it. In the inner circle, citizens engage in conversations about how to make provisions for all. These conversations would be guided by civic norms of moral equality and reciprocity. They would aim to design systems of provision that would create and maintain balanced social relationships. The middle circle contains the basic process of an economics of provision, which would be the same for all systems of provision: human providers transform natural provisions to provisions for our families and communities. Each one of the entries in the outer circle represents a system of provision, and each system would include all the social organizations and institutions that facilitate providing what we as families and communities need and deserve. Above all else, designing our economy as civic systems of provision requires our willingness to engage in civic conversations that not only transform our perceptions of our social worlds, but also, in the process, repair the violations of our common humanity. If we can engage in such civic conversations, we can then work together to change our economic system to one based on civic membership rather than property ownership. Such a change will be disruptive and disturbing, especially for those who benefit from current social systems. If we understand social systems as sets of social trends influenced by positive and negative feedback loops, then changing systems requires us to examine what is supporting current trends and then to change them to support trends that move in a different direction. Kenneth Boulding has argued that three different types of power maintain social systems: integration, exchange, and threat.9 If we can change the beliefs (integration), incentives (exchanges), or laws and rules (threats) of current trends, we will change the trends. I believe all three changes are necessary. Changing our picture of what a just and sustainable economy would look like is only part of the work to be done. Still, it is a necessary part. Surely it is now time to think deeply again about how we will live together and with nature. We must turn the various systems of provision—from food to entertainment—toward just and sustainable practices. Justice requires that we all do it together. Sustainability requires that we do it now rather than later. A civic economics of provision requires above all else a strong notion of citizenship—of membership in a global civil society. With this common identity, we can allow civic rather than property relationships to define our bonds with each other—at work, in our neighborhoods, in our cities, and in global communities. A civic economy would ensure that making provisions, not accumulating property, is at the core of our economic thinking. The core goals of a civic economics of provision is to ensure that all of us have access to basic provisions, that all of us have a say in how these provisions are provided, and that the integrity and dignity of all providers—people and planet—are protected. The inner circle is comprised of civic conversations, where citizens deliberate and decide how human providers will transform natural resources into provisions for families and communities, interactions that make up the middle circle. The outer circle is composed of groups and agencies involved in the provision of food. This system’s overall purpose is to provide food for all in a just and sustainable manner. Switch the basis of the economy from property relations and ownership to civic relations and civic membership. Place the wealth of families and communities at the center of the economy’s purpose, rather than the wealth of isolated individuals or nation-states. Change the goal of the economy from economic growth to making provisions for all. Associate, rather than dissociate, Europe and white America’s wealth with the misery of slavery, colonialism, and its legacy. Treat labor and land as providers rather than property. Treat people at work as citizens with the rights of voice, representation, and respect. Locate the primary function of money in different systems of provision rather than in financial markets. Treat money as a civic means for making provisions rather than as a commodity/property. Engage in conversations that aim to repair the past violations of our common humanity, instead of assuming that one can create a new future without accounting for the past. Recognize ourselves as a part of nature, rather than seeing ourselves apart from nature. Instead of trying to change the economic system as a whole, this approach focuses on supporting positive trends and resisting negative trends of different systems of provision, such as the food or health care system. This change process would begin with bringing together all stakeholders—businesses, government agencies, and civil society organizations—engaged in a particular system, and encouraging them to invite each other into civic conversations based on norms of equality and reciprocity. Instead of trying to change the economic system as a whole, this approach focuses on supporting positive trends and resisting negative trends of different systems of provision, such as the food or health care system. By examining specific systems of provision, each system’s particular challenges will become more easily recognized. In the system of food provision, for example, participants would pay just as much attention to the greenhouse gases emitted by animal agriculture as by the burning of fossil fuels. After such examinations, the participants would work out strategies to move the trends of these systems toward justice and sustainability. They would use all three of Boulding’s system organizers: integration (changing beliefs), exchange (changing incentives) and threat (changing laws). If these conversations achieve their potential, participants will repair past violations of our common humanity as they see one another as citizens with equal rights to provisions for a good life and to protection from poverty and trouble. Civic conversations occur when people acknowledge their common humanity and address questions of how to live together in light of their social differences. This work is global in scope, and can happen (and is now happening) in many different places. The power of civic conversations to make changes will depend on having the right people in the room. Changes in the geographic scope of the conversation will also alter who should be invited. For these different systems of provision to become more sustainable, many of the provisions for communities will have to be produced and distributed by the communities themselves. So far, we have not repaired the violations of our common humanity caused by slavery, racism, and their legacies. So, a white elite continues to live in a privileged bubble that ignores the vulnerability of human and non-human communities. Increased pressure from climatic changes and social unrest are signs that things cannot continue as they are, but so far we have not found the political will to make the changes that would match a civic economics of provision. A civic economics of provision offers security though civic membership rather than property ownership. It relies on people investing in relationships rather than guns. It requires something that we, as a people, have never done before in the United States: share a common humanity. This will take time. We move one step forward (a Black president) and a step back (Donald Trump). At the same time, the steps forward are new and creative (marriage rights for all), and the steps back are old and defensive. It will be a long fight, and a long night for many who live without provisions or protections, but it is always time to move forward. I would place this proposal in the middle of the spectrum, from imminently practical to purely speculative. This model’s theory of change has been largely presented in the previous sections in the use of Boulding’s triad of integration, exchange, and threat (persuasion, incentives, and regulation). Change happens when a combination of powers work together to move social trends in different directions. A good example is the change in cigarette use in the US. Tobacco companies used advertising, entertainment, and culture to increase tobacco consumption. This trend was interrupted and reversed though a combination of people telling the truth (education), re-calculations of health costs (incentives), and winning battles for smoking restrictions (regulations). All three powers need to be used together. The changes brought about in the 1960s were largely leveraged by education and legislation. In hindsight, incentives were not changed enough to prevent the development of reactionary forces that became dominant in the 1980s, and continue to drive the direction of social systems today. Changing incentives is just as necessary as changing beliefs and regulations. The “next system” will be a result of changing current social trends, trends which must be disrupted before we can transform them. This does not mean that every disruption or every social movement is positive. I now believe that the change we need will not happen on the level of social interactions, but must go deeper to the level of our common humanity, which emerges through civic conversations. The biggest impediment to civic conversations is silence—the silence of privilege. In contrast to the Lockean tradition, where ownership precedes civic membership, this approach places civic membership as a condition for ownership. Instead of assuming that possession implies ownership that the state then acknowledges and protects, the civic economics of provision framework sees the state as the origin of ownership. Owning property is like having a concession to use a common resource. In contrast to the Lockean tradition, where ownership precedes civic membership, this approach places civic membership as a condition for ownership. Instead of assuming that possession implies ownership that the state then acknowledges and protects, the civic economics of provision framework sees the state as the origin of ownership. In corporations, the real issue is not ownership, but control. The German model of codetermination in corporations is a good example of distributing control among workers and investors. Instead of dividing the economy into different sectors, this model divides the economy into different systems of provision. Banks, for example, would not belong to a financial sector, but to different systems of provision. Their functions in each system would not be determined by bank owners, but by civic policies defining the role of money in making provisions. Ownership, in other words, does not determine function; rather, civic conversations do. In many cases, citizens would probably decide to have public or cooperative banks rather than privately owned banks. In any system of provision, such as food, housing, or entertainment, there are public and private actors and agencies. Private investors may make investments based on their calculation of return on investment. But the business itself must remain focused on its purpose of contributing to the system of provision. Public investments would provide capital for doing necessary work, which private investors would not support. Such public investments would also create jobs and increase the buying power of communities. (c): What is the role of private profit and the profit motive? Who owns and controls economic surplus? Persons have motives; organizations do not. (They do have a “culture” or relational style.) Corporations are designed to make specific provisions. Generally, increased value created by any system of provision belongs to the whole system, even though it may appear in one part of the system, such as business corporations. This increased value should be distributed back to the whole system, through taxes, because the system “owns” it, not the corporation or its stockholders. Businesses should be licensed (controlled) to function in their particular system of provision, and to contribute to the making of provisions in a just and sustainable manner. Corporate charters should be revised to make this much clearer. Citizens would decide how to distribute provisions. The production and distribution of some provisions would rely more on markets than others. Market competition can be effective when it is contained by rules and assumptions based on civic cooperation, as well as the principles of moral equality and reciprocity. If some basic provisions, such as food or housing, are distributed through competitive markets, then citizens should have access to a basic income so they can participate in such markets. Wages would be based on the civic principle of reciprocity, where a good day’s work gets a good day’s pay, which would be enough income to “make a living” for one’s family. Wages or salaries that go beyond this moral minimum would be largely determined by the market. It is important to remember that most property-based wealth is not created by competitive markets, but by non-competitive salaries such as CEO stock options; by fees, such as fees for financial services; or by various forms of unearned income, such as increase in land value. Ownership does not determine function; rather, civic conversations do. The process of changing civic systems of provision can be understood as civic planning based on civic norms. Is this process also democratic? It would be if the participants do not exclude alternative views, engage in deliberation, and learn from each other. Instead of the current ideology of comparative advantage, which puts developing nations at a disadvantage in terms of creating self-governing public institutions, international trade would aim to make all communities more self-sustaining. The locus of economic life is the family and community, instead of either the individual or the nation state. Because of a long history of colonialism and exploitation, which continues to infect current global trade policies, we do need to repair the violations of our common humanity through new policies that will benefit peoples in former colonies. These policies should focus on economic systems of provision that are for the people rather than for international corporations. Successful competition is always based on agreements to play by the rules (cooperation). Through civic conversations, we can change these rules so the competition aims at the improvement of making provisions. As we now know from the work of Ostrom and others, citizens have maintained a commons for their use without abusing it.12 This is possible because community members develop rules together for governing the commons. So, a commons can provide commercial benefits without being “owned” as property. This is close to the idea of treating a business as a concession (see above). Private property is a legal entity created by law and protected by law enforcement. In this model, private property is seen as a concession given to individuals and groups when such a strategy is the best way to manage resources. The mix of business enterprises would parallel that of civic conversations in designing systems of provision. If one thinks of providing food in an urban area, for example, and looks at all the participants in the system, they would include: local food markets and restaurants, food suppliers and processors, food producers and growers, government agencies on the local, state, and national levels, food advocacy groups, banks and transportation agencies. Answering the question of how to provide good food for all in a just and sustainable manner could require invitations to any of these groups, and even others, to get a handle on how to make the desired changes. Corporations are legal or civic creations and citizens can change them by changing their charters. Therefore, a civic economics of provision would see civic conversations as the location for determining the future design of corporations. Corporations continue to gain control over our social life through the commodification of things, sponsorship of everyday activities through advertising and philanthropy, and financing electoral politics. For the most part, they are shaping our social context as we see ourselves as consumers and laborers, rather than as citizens. To think of liberty without thinking of slavery is to deny our past and to throw away the future. The civic approach envisions a different future, where corporations are constrained to their own system of provision—where they have some expertise—and restrained from other systems where they do not, such as the system of electoral politics. Furthermore, instead of corporations deciding what they will “give back to the community,” citizens should determine their civic obligations as part of the mix of enterprises in the different systems of provision. In the future, corporate boards should represent all stakeholders, so their decisions will match their civic obligations. (m) What role do you see for innovative corporate forms, co-ops, public enterprise, social enterprise, and public-private hybrids? All of these forms are possible from a civic perspective if they are based on civic norms, address the violations of our common humanity, enhance the making of provisions, and advance justice and sustainability. In time, we will need to move toward something like a basic income for all, simply because a sustainable economy must produce less rather than more. I think we can design life-work models where people use local currencies to trade with neighbors for perhaps 20 percent of their needs, receive a basic income for 30 percent, and work two or three days a week for the other 50 percent. Systemic change almost always requires the organization of citizens who can hold those in administrative positions accountable.13 The struggle of labor unions for recognition and fair wages is an important legacy of our current social systems. Their effectiveness in moving current systems toward justice and sustainability depends on their contribution to the creation of meaningful civic conversations. There can be multiple currencies. Local communities could create their own currency and allocate it through a time bank. This currency would facilitate local trade and the building of community. Governments could also create money and allocate it either directly to citizens in the form of a basic income or through local banks for loans for the making and receiving of provisions. Income inequality will continue to increase until we have the political will to control it. Piketty has argued that we need a “progressive global tax on capital.”15 The civic economics of provision does not guarantee the creation of such a political will, but at least it identifies political involvement as a necessary part of any adequate understanding of system change. This model focuses on families and communities, not on individuals or nation-states. The awareness of our common humanity and the civic norms of moral equality and reciprocity would support caring for others. In civic conversations, all differences are recognized as sources of knowledge, including racial, ethnic, and religious differences. Participants in these conversations are invited to explore how to repair violations of our common humanity by the economics of slavery and its legacy. Such repair can open the way to create the humility necessary to address issues of social inequality and climatic destruction. Real progress in creating a viable system of provision and protection will not happen until we address issues of white superiority and impunity. The civic would not be dominated by any religion, but invite all believers to become members of the civic. The civic is grounded in our common humanity. Different religions, of course, inform us about what it means to be human and to live in a human community. The focus on relationships rather than individuals as the basis for the civic economics of provision has been strongly influenced by feminist ethics and economics. Historically, of course, the social was the world of white male property-owners. The civic model places the family and community as the key groups that receive provisions, and, in many parts of the world, women manage families. Men, women, and all forms of families belong to the civic and have moral equality. The civic conversations that lie at the heart of civic economics of provision would serve as the basis for local, regional, national, and international communities. Active participation in these conversations would be central to creating, maintaining, and improving all the systems of provision. This model assumes it is possible to change from a commercial to a civic framework, which requires an acknowledgement of our common humanity. In a sense, this turns everything upside down: instead of the commercial serving as the basis for the civic, the civic will serve as the basis for the commercial. The realization of civic systems of provision depends on our ability to develop a civic consciousness that is grounded in our common humanity and our capacity to engage in conversations with others who bring different stories and alternative points of view. Such a consciousness can emerge from actual encounters with others who have diverse pasts and a common future. The interplay between consumer choice and advertising could function as one guide for the direction of some systems of provision. Others, such as health care, would depend more on citizen concerns about how we live together. Overall, a sustainable society would decrease consumption and increase the sharing and/or renting of things. A civic community would support life-long learning and the development of meaningful relationships among citizens, which would include volunteering and helping those in need. These programs, however, should remain local and not become a substitute for developing economic systems of provision that provide for all. (a) In your work: If your system addresses environmental concerns, how do you conceptualize “the environment”? Do you envision the economy as nested in and dependent on the world of nature and its systems of life? This model makes a distinction between social and natural systems. Social systems (including the economy) are verbal and non-verbal communication patterns that create trends subject to positive and negative feedback loops. They are maintained and can be changed through threat, exchange, and integration. Natural systems are cyclical and self-organizing, which is aptly illustrated by the role of photosynthesis in the carbon cycle. Social systems need corrective human interference. Natural systems need to be protected from abusive human interference. 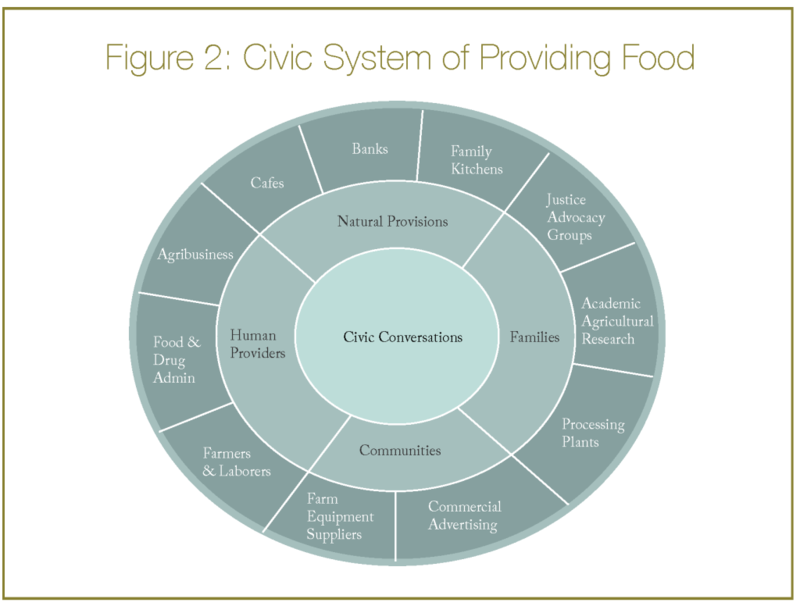 As the picture of the food system illustrates (see figure 2), the environment is seen as a natural provider that human providers transform into provisions for families and communities. Our common humanity and the natural commons are so totally intertwined that the right to flourish belongs to both human and non-human communities. The civic approach places our common humanity as belonging to the natural environment, as well as existing in society. The civic space emerges between our human nature and our social differences. This triadic approach allows us to recognize that we belong to the natural environment, instead of the natural environment belonging to us. Thus, a civic approach to environmental issues is not merely utilitarian, but also ontological. Nature is a provider for human and nonhuman communities. Both natural and human providers must be protected from abuse and treated with gratitude for their gifts. The global striving for continual “economic growth” almost ridicules such a stance toward nature. So we need to think about how to move toward an appropriate relationship between the environment and us. I like the approach of the Natural Step.16 It proposes that we begin with an image of what a sustainable global community would look like, and then we examine how to move in that direction. This will entail that nations with greater capacity for making changes help those who have less capacity. Because of colonialism and its legacy, the contemporary property-based social system dominates the world, which means that most responses to environmental challenges are based on utilitarian calculations. A civic approach would argue that these calculations should never override the moral principle of protecting the natural provisions from destruction. (d) Does your work explore the links between large-scale environmental challenges (like climate change) and other economic and political issues? This model proposes that instead of treating land (the environment) and labor (humans) as commodities, we treat them as providers. The perpetuators of the commodification of living beings endanger both the environment and our humanity. It would be great to ensure that each person has equal representation in our Republic, but given the procedure for changing the relationships among states and the federal government, such modifications are unlikely. Our biggest challenge today is the Supreme Court’s interpretations of the Constitution that have given political power to corporations and wealthy individuals. A civic economics of provision would aim to create the political will to ensure that the Court does not continue to favor corporate interests over those of citizens. The American idea of liberty gets most of its meaning from the concept of not-being-a-slave. The Founding Fathers were white male property owners, and many, like Thomas Jefferson, owned slaves. A careful reading of John Locke, who invested in the Atlantic slave trade, makes it quite clear that liberty means owning yourself and your property rather than being owned by someone else. To think of liberty without thinking of slavery is to deny our past and to throw away the future. To secure a future for all of us, we need to ensure that all individuals can see themselves as members of the civic—a membership based on the civic norms of moral equality and individual dignity. Liberty would then be based on our common humanity, not on the ownership of property. Power today resides mostly in the design of organizations and institutions.17 If you redesign the organization, you change the location of power and power relations. If we want to change the influence of billionaires in electoral politics, we must simply change the political structure. If we want to change the influence of billionaires in electoral politics, we must simply change the political structure. Civic conversations serve as the centerpiece of this model. Such conversations can occur in different types of organizations—public and private—and in different contexts—local and international. The general questions concern how we provide for, and protect, one another. These questions can direct a conversation among neighbors or among nation-states. The civic economics of provision model invites people to join with others in civic conversations. It proposes that civic deliberation about differences can bring about better results than the use of force or violence. In some contexts, such conversations are possible. In others, they are not. The limits of the civic are the limits of deliberation. This model assumes that people have the capacity to learn how to govern. It also assumes that we can re-shape our social lives in many different settings, through persuasion, incentives, and regulation. Government is also a social institution, like the economy, and one must take into account the social identity of politicians (race, class, education, and so on). In some ways, government is no more grounded today in the civic than other social organizations, but, at the same time, the chances of reforming government are not any less than of reforming any other social institution. Civic conversations are based on a notion of “strong” and deliberative democracy.18 The principle of subsidiarity appears here too. In local settings, direct democracy is possible. In larger settings, representative democracy would work. Since civic conversations are based on our common humanity, participants would focus not so much on the exchange of ideas, but on the improvement of ideas. (h) Friedman, among others, believed that only a crisis produced real change. Another old expression is that “good government is just the same old government in a helluva fright.” Do you examine crisis-driven political change and crisis preparedness? Instead of crisis-driven change, I would like to think in terms of proactively redirecting social trends. As bad trends run their course, they have more and more negative consequences and people who experience these consequences can tell the rest of us what is happening if we listen to them. Instead of waiting for crisis, I would much rather support critical journalism that would bring into public view what is happening to our neighbors and the environment. The role of government is central to the civic economics of provision model. Every system of provision needs a multitude of organizations to make provisions for all, and the role of government would differ in different systems. The provision of health care, for example, will probably be largely a government program. Food would be a mixture. Entertainment would be mostly nongovernmental, although cities may want to develop community-supported museums and music halls. If we say that government can create money when there is a need to pay for real work, then government expenditure depends on social conditions. It also depends on the decisions by local and beyond-local participants in civic conversations. Some communities might decide to use voluntary food banks to provide sustenance to those who do not have the money to purchase from markets, or communities might decide to provide government food stamps instead. The question is how to involve the people in these conversations who know how to develop the best approach. Instead of crisis-driven change, I would like to think in terms of proactively redirecting social trends… Instead of waiting for crisis, I would much rather support critical journalism that would bring into public view what is happening to our neighbors and the environment. People also organize for what I would call “civic movements,” such as the civil rights movement in the 1960s or the feminist movement in the 1970s. These movements aim at advancing the civic ideal of inclusion, respect for others, and moral equality. While there are few examples that match the model completely, there are many examples of its different parts. There are civic organizations that consider the production and distribution of different provisions from the national to local level. On the one hand, the various departments of the president’s cabinet—from Housing and Urban Development to Energy—can be seen as concerned with the making of provisions. On the other hand, many cities have civic agencies concerned with provisions. Many of these government agencies are also collaborating with nonprofit and business organizations to improve the allocation of goods and services. There are citizen action groups at the local and national level focused on improving production and distribution of different provisions. Many cities today, for example, are embroiled in controversies over rent control, affordable housing, and housing speculation. With the growth of social media, groups and networks abound that are trying to move current systems toward more sustainable directions. There are cooperative and public banks that function close to how banks would function in a civic system of provision. There are groups, such as “Black Lives Matter,” that extend an invitation to engage in civic conversations that could facilitate the repair of our common humanity. 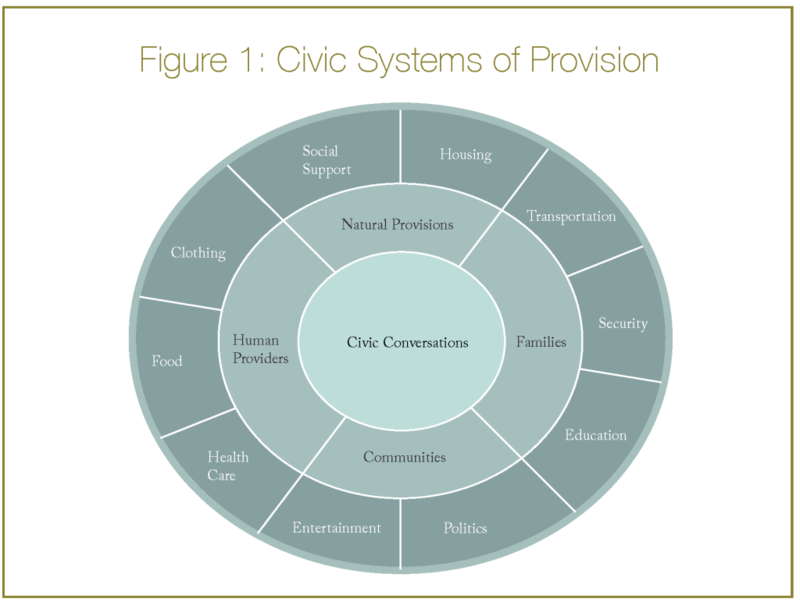 The civic economics of provision model is essentially a learning model. We need to learn from each other how we can live well together. As a teacher, I have never felt alone in this project, but rather have assumed that many others, in numerous different ways, are doing the work that needs to be done. At the local or city level, there are many practices that fit with this model as indicated in the previous answer. The Swedish social system is close to this model, as are other European systems on the distribution of some provisions. There are some parallels with the sharing economy, the commons movement, and Peer-to-Peer practices. The decolonization projects in South America, Africa, and Asia also align with this model. 1. Marvin T. Brown, Civilizing the Economy: A New Economics of Provision (New York: Cambridge University Press, 2010). 2. Brown, Civilizing the Economy, 19–33. 3. Julie A. Nelson, Economics for Humans (Chicago: The University of Chicago Press, 2006), 1. 4. Daniel W. Bromley, Sufficient Reason: Volitional Pragmatism and the Meaning of Economic Institutions (Princeton, NJ: Princeton University Press, 2009), 180. 5. Virginia Held, Feminist Morality: Transforming Culture, Society, and Politics (Chicago, IL: The University of Chicago Press, 1993), 72. 6. Nancy Folbre, The Invisible Heart: Economics and Family Values (New York: The New Press, 2001), xii. 7. Lawrence C. Becker, Reciprocity (Chicago, IL: The University of Chicago Press, 1986), 107. 8. Brown, Civilizing the Economy, 210–221. 9. Kenneth Boulding, Three Faces of Power (New York: Sage Publications, 1990). 10. Martha Nussbaum, Creating Capabilities: The Human Development Approach (New York: Belknap Press, 2013). 11. As proposed by Henry George in Progress and Poverty (New York: Robert Schalkenback Foundation: 1997). 12. Elinor Ostrom, Governing the Commons: The Evolution of Institutions for Collective Action (New York: Cambridge University Press, 1990). 13. See Jeffrey Stout, Blessed are The Organized: Grassroots Democracy in America (Princeton, NJ: Princeton University Press, 2012). 14. Nussbaum, Creating Capabilities: The Human Development Approach. 15. Thomas Piketty, Capital in the Twenty-First Century, trans. A. Goldhammer (Cambridge, MA: Belknap Press of Harvard University Press, 2014), 471. 16. “The Natural Step,” http://www.thenaturalstep.org/. 17. Marvin T. Brown, Corporate Integrity: Rethinking Organizational Ethics and Leadership (New York: Cambridge University Press, 2005), 91. 18. Benjamin Barber, Strong Democracy: Participatory Politics in a New Age (Berkeley, CA: University of California Press, 2004).